We wrote the following short article for Danish Havkajakroerne as a part of the formalities required for Red-White Ribbon. Suomalaisille lukijoille tiedoksi, että kirjoitimme vielä erikseen suomeksi artikkelin matkastamme. Artikkeli julkaistiin Meloja-lehden numerossa 4/2009. We have done one longer sea kayaking trip almost every year. We paddled the Finnish Blue-White Ribbon back in 2005, completing the journey after 28 days and 1269 km. Last summer (2008) we paddled from Stockholm to Helsinki. The previous summer (2007) was an exception, as we needed all of our holidays for our trip to climb Aconcagua in February 2008 ..
We have had interest for paddling the other Nordic Ribbons for some time, and this summer we finally had the chance to attempt the Danish Red-White Ribbon. Actually, in the spring we were thinking of two different options – two-week trip in the Lofoten area in Norway or four-week trip around Denmark. Denmark won. Before start we had some email exchange with Peter Unold, receiving valuable tips and information. For example, he he helped us to solve the issue of parking our car by suggesting that we should drop our kayaks to the starting point Vidåslusen and then drive the car to a yacht club in Egernsund where it would be waiting for us. Thanks Peter for the information you gave. Actually, when Rauli’s father heard of our plans, he volunteered to drop us to Vidåslusen and drive our car to Egernsund. He spent two or three days in Denmark before he took his flight back home. He has retired from work so he had the time to do so. He went to Gråsten Sejlclub and asked for permission to park the car there for a month. The permission was given, without any parking fee to be paid .. The car was on the club area inside a fence and a gate which was locked for every night. There was our car waiting for us when we arrived. He kept the car keys, but we had spare keys with us. Without such arrangement, we think that easiest (but expensive) way of doing it would be: Drive the car to Egernsund (or other place near the border) and take a taxi back to Vidåslusen. Our trip begun on Sunday 12.7.2009 from Vidåslusen at about 7 in the morning, in the moment of highest tide. We paddled out with the outgoing current, nearly missing getting stuck on the Jordsand. Vadehavet area was interesting piece of paddling – you will need to negotiate with shallow water when paddling the Finnish coast as well, but without tide. With tidal difference of 1,5 meters, it took some effort to navigate around shallows. The gap between Fano and Skallingen had very interesting waves. 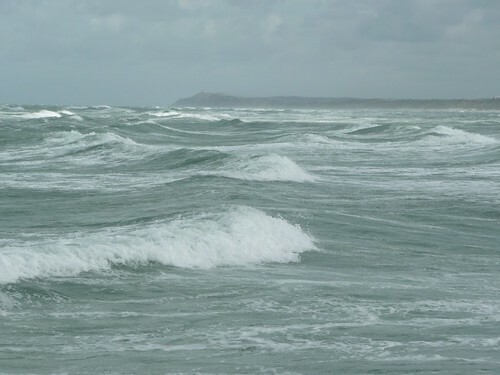 As the wind was about 8 m/s from west with 1 m wind waves and the tide was pushing water out of the area, the waves grew about twice as high as normal and were constantly breaking. I remember myself thinking “Hopefully we don’t have to land with these waves”. As we were nearing Skallingen and out of the current, the waves returned to normal size and it was quite straightforward to land for lunch break. Mostly the west coast was uneventful. Just paddling, handling some waves, daily surf starts and landings. Easy to navigate when compared to Finland. Just keep the coast on the right. Not much need for the compass. However, there was one special event on the west coast. I lost my regular eyeglasses on the west coast, on an unsuccessful attempt to launch through the shorebreak. The dumping wave that looked like a bus-stop in a city lifted my kayak standing on it’s stern (like a candle) and the threw the kayak upside down, and tore off my glasses. I lost my grip on the paddle (fortunately I had the paddle leash) and I was forced to wet-exit when the waves were throwing the kayak towards the beach. There was no way I could have hand-rolled the kayak then. I was able to pull the kayak back to the beach. Next morning we launched successfully. There was one other similar event when we were landing on a beach. One breaking wave caught me by surprise and I had to hand-roll the kayak “hand-on-the bottom” as it was too shallow to attempt anything else. Then we had to stay two days in Løkken while waiting for the western 12-14 m/s wind to settle. It would have been extremely difficult to launch a loaded sea kayak, not even thinking of paddling. Finally we reached Grenen, the tip of Jylland on 23.7. continuing immediately to the eastern side. Probably the most demanding part of the journey was behind us – or so we were thinking of. Next morning was our first without surf launch ..
On the eastern side of Jylland we still had to navigate through shallows on the mouth of Limfjorden and some river mouths as well. Here we also had our first difficulty on finding good camping spot, and for the first time had to rely on commercial camping ground at Fjellerup Camping. In Finland, one is allowed to put up a tent and stay for the night almost everywhere without having the landowners permission. Of course you shall take all your carbage with you, you may not build a fire, and you must stay at least 200 meters away from houses and private yards. Before our trip we understood from Peter Unold that camping in the wild is officially forbidden in Denmark, but that people do it anyway and mostly without problems. We camped on empty beach or such 21 times, on commercial camping ground 4 times, and spent two nights at a guest house in Løkken while waiting for the western 12-14 m/s wind to settle .. In Copenhagen we pitched our tent on the Bryggens Kajak Club backyard. We did’t know about the agreement between Danish clubs which allows to do so. We were extremely tired in the late evening when we were paddling throught the channels Copenhagen. Suddenly we saw a paddler launching (her) kayak, and then a club with people on the backyard. In other circumstances we would never asked for a permission and continued paddling until we find an empty place to stay, but it was becoming dark already. So I asked for permission to stay for the night, and the good people told us that we would be welcome to stay there for the nigh – althought the said the cannot give official permission as they are not officials of the club. We took as short route as possible, but doing larger crossings only when necessary. The weather was good for the Great Belt crossing, so we chose direct line towards Sjaellands Odde via island of Hjelm. That day was our longest paddling day, as we paddled 30 km in the morning, then after lunch break we did the crossing over 37 km route, and after reaching Sjaellands Odde we had to continue for some time before finding suitable place to stay for the night. On the island of Sjaelland there clearly was problem with the ladybirds. We also had our share of the problem with ladybirds invading our kayaks and our tent. At some places it was strange to notice that some of the ladybirds did actually bite humans. We later found an article stating that this is second year in row with this problem existing. We also learned from Wikipedia that some species of ladybirds are known to bite humans, perhaps in search for salt. Search for salt could also explain their rush towards kayaks on the beach. We had met some paddlers on the east coast of Jylland, but Koge was the first place where we had a bit longer discussion with local sea kayaker. That was interesting discussion, during which we learned the fact that Danish clubs have this agreement of hospitability that allows paddlers pitching their tents next to sea kayaking clubs. After Koge there was the Stevns Klint, quite spectacular formation of rock after the flattish west coast. When paddling along the cliffs, the eastern wind increased to 9-10 m/s which itself shouldn’t be too much, but we were already tired and chose suitable place to land. It was nice to walk up to the cliffs and see the views. Next morning the sea was almost flat as we paddled past rest of the cliffs. Only once we had our camp on a place that a Finn would call a forest. That was at Viemose Skov, on the day we passed rest of the Stevns Klint. Rest of the trip mainly consisted of short crossings between smaller and larger islands. We crossed Langelandsbelt in the middle of Langeland, then we chose our route south of Langeland and Aero, and made the final crossing of Lillebelt when there was 9 m/s (measured at Kegnaes) southeastern wind blowing. The latter was nice downwind session with breaking wave tops only near the Kegnaes when the water got shallow. We could have finished the trip in 27 days, but we chose to put our final camp at Broager land just 20 km away from the border. In was much more comfortable to finish the journey on daylight. Just on time to catch our ferry back to Finland, leaving from Travemunde after midnight. We arrived on the German border and Graensesten nr 1 on Saturday 8.8.2009, completing our paddling of the Red-White ribbon after 28 days and 1228 km. Route and our camps / places where we spent nights during our paddling of the Red-White Ribbon 2009. Camp places are as exact as I could do with Google Maps. I found it very difficult to draw our exact route with Google Maps tools, so it is presented here only as a rough estimate. Would we do it again ? Lets put it this way – now that we know how demanding it is, would we do it if we wouldn’t already have done ? The answer is yes. Paddling of the Red-White ribbon was both physically and mentally demanding, we were sometimes really tired (of it), but it was rewarding to understand that we finally arrived to the ending point. The best thing was, that when returning to work, Rauli had forgotten the password of his computer at work. That is something that every holiday should do ! We enjoyed the differences in landscape and conditions between Danish and Finnish coastala areas. The west coast was magnificent – beautiful beaches, small towns an villages, the sea and it’s features. We really enjoyed it, despite the few events we had during paddling it. The west coast is really something to be recommended for experienced paddlers. It was very welcoming experience to meet Danish people during our trip. Thanks to all of you !